So I've been playing for over a year and I know this is going to follow me all the way through the rest high school and college, so I need to invest in an amp I can always rely on. I'm mainly looking for versatility and value over anything else. I don't need anything that'll take the pictures off the walls and I own a multi-effects pedal so I don't need any of those bells and whistles. 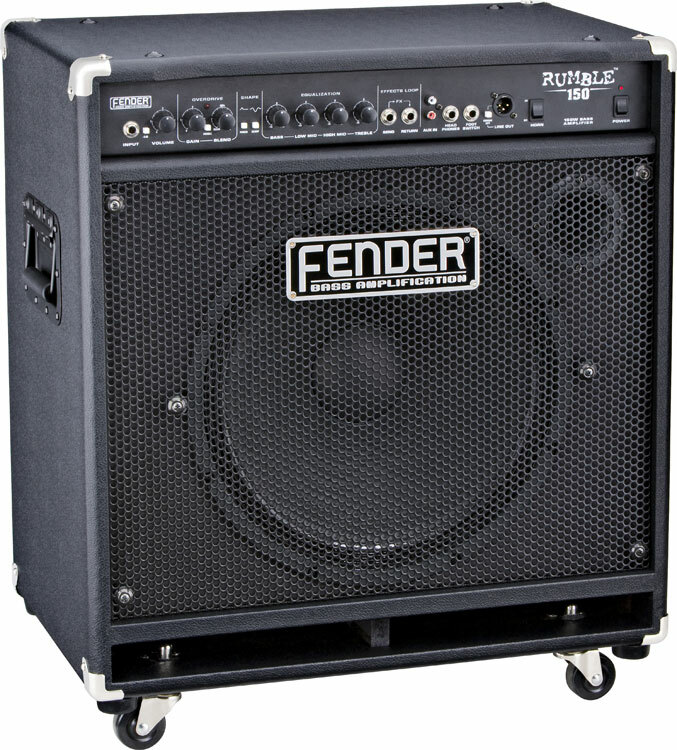 My only idea so far is the Fender Rumble 150, but I'm not sure if that's the best buy even though it has everything I need. Any and all recommendations are appreciated, thanks in advance. Are you going to gig? If so, you may need something with more power, perhaps 300w. I have a Markbass 300w combo and love it because it is light, powerful and, though it is a combo, it can be used to power a cabinet, should I ever need it to. Markbass amps can be pricey but I bought it used @ Guitar Center so it was affordable. I'm not, I mostly play at home any other friends houses. The most I'd play at is a shop in the local mall or a party, but I still need a good amp because my others are either half broken or are just cheap. I looked at cabinets, I definitely don't need that much power. Does anyone have any suggestions? I'm mostly looking for a combo amp. On second thought, I thinking of downgrading to a 75 instead a 150, I don't need that much power. Acoustic is also a great brand, I use the model 118, but you can't get those at most stores any more- just pawn shops and ebay- any ways, It's a great brand and I would suggest the B200 because you could also use the -15db input jack if you need it to be more quiet, they also of course, make smaller sizes. I would stay with the 150 if you plan on jamming with others. The general rule is you should have 2 to 3x the combined wattage of the guitar players. Over the past 3 weeks, I've become very indecisive. What would you guys say to the Marshall MB30 or Orange Crush PiX CR25BX 25W? I own the this exact combo amp that you have posted and it works very well for small gigs with a 3 man band. Your sound will get grounded out if there is another guitarist and or keyboard player added to the mix. I would suggest going bigger if this is indeed your case of number of players. I myself prefer the natural sound of the bass, and this amp does provide the all around sound you need - even some deep low end. I needed to go bigger, and since I liked what Fender could provide for me I purchased their 4x10 cab ( $300) continuous 500 watts, and programmable up to 1000 watts. I added a Behringer 450watt head for about another $300 used (floor model ). I have plenty of head room for the money that will last me a long time. Whether you need a lot of power or not, I believe it is a wise choice to go big even if you may never need it at this time, I'm sure down the road you will need it at some point. Bottom line, get the most bang for your buck! If you are going to be playing with others or doing gigs you will need more power than 25 or 30 watts. Rule of thumb is bassist should use twice the power of your guitarist. The bass has to move alot more air and it takes alot more power. I practice with a 20 watt Hartke and I have to max out the amp and my bass just to keep up with guitars and they are using line 6 75watt. I personally like the Gallien-Krueger MB112. 200 watts and only 33 lbs, $339. I like the ampeg sound so the natural choice due to ease of mobility and durability I was shown the Gallien. It has that soft Ampeg sound but also the punch to push through guitars and drums. Check that one out. I am purchasing either the Gallien-Krueger MB112 200 watt or the MB210 500 watt. I have not decided yet but will get it next month. Go big you will need it at some point especially if you are out jamming.